Last weekend I attended a food bloggers conference, to be precise, the International Food Bloggers Conference In Santa Monica, CA. It was my first experience at such an event and I came away with lots of information and impressions to digest and process. 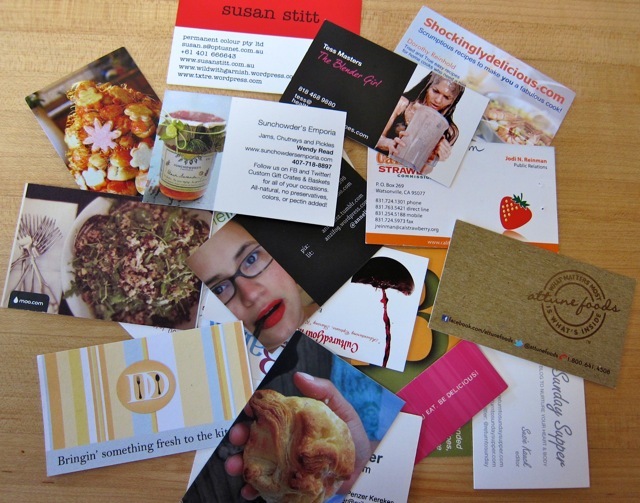 There were over two hundred people at IFBC and I was fortunate to meet so many folks, almost all food bloggers. The vibe was definitely relaxed and friendly, and I was inspired by the gathering of so many food writers. I sat in on a provocative panel discussion about recipe development and related moral/ethical issues, heard an author and a literary agent talk about how to propose/pitch/publish a cookbook, and listened, in a daze, to a technical presentation about SEO. There was a food photography and styling lecture and a compelling presentation on monetizing blogs outside the on-site advertising loop. But it was the people I met who color my memories of the weekend. When I realized it was Kathleen Flinn speaking about her new book, “The Kitchen Counter Cooking School”, I was able to find her later and describe what her first book meant to me. It was after midnight when I finally put down my signed copy of her latest cooking memoir. There was Dianne Jacob, whose “Will Write For Food” has guided me this past year, just as its first edition prompted me to begin thinking about food writing. Dianne is as funny and approachable as she is a rich talent, “the” informed voice of food writing today. Sitting in the lobby with Dianne and another friend, until well past our bedtime, finished up day two. 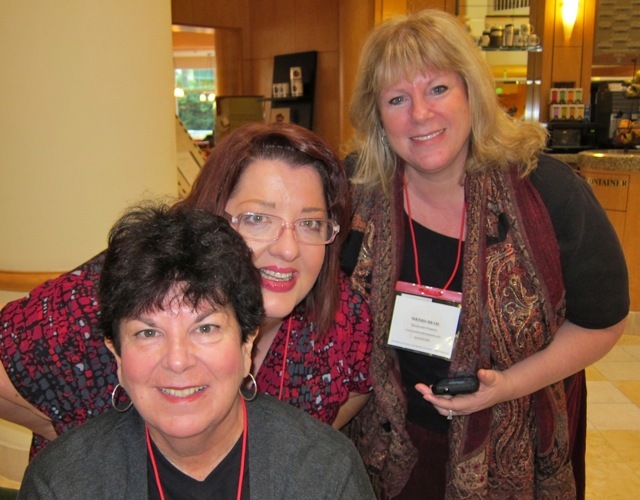 IFBC gave me a chance to meet two women who had become online friends for the past two years. Wendy, Elizabeth and I enjoyed a “reunion” and spent after-hours sharing life stories as we drank Elizabeth’s wine and dipped apple slices into Wendy’s artisan jams. It was a gift to come away from IFBC with friendships forged during the weekend. I was happy to see Greg, Andrew, Melissa and Rachael, four huge talents, all LA-based, who have each supported me during the past year. As I looked around at the crowd gathered at Andrew’s after-party, I felt thankful to be part of such a community. Liz, I wish that I had been there! All subjects I really want to explore. Tell us more! Nice pic and I love your earrings. Great close. No, you are definitely not retired! But it seems like you are enjoying yourself, and that’s what matters. It was delightful to sit and talk Saturday night with you and Wendy. I still can’t believe you have 70 recipes on Food52. That is almost enough for a cookbook. Thanks so much for the mention of me and Will Write for Food. Thanks, Dianne. Yep, I gave Amanda Hesser 70 recipes but gained so much both from my experiences on the site and from the folks I met. A wonderful post! What a great experience! I especially loved the ending! Well done to you! We talked about you all weekend, Jane – Wendy and I are determined to get us all together one of these days. I love your writeup of the conference – thanks for sharing. All the classes you mentioned are much needed by me. But one step at a time. It definitely motivates me to go to the next one. And I love, love, love your haircut!!!! So youthful and stylish!!! LOVE it! The haircut has been liberating – and it would be fun to plan ahead and think about IFBC next August – let’s get a gang together! Liz, what a heartfelt post. I enjoyed reading it and hope to see you again soon. Thank you, Carol – any chance you will attend the White On Rice holiday get-together? I think we discussed this at IFBC…Hope to see you there. I agree – great ending! Sounds like a nice experience. Jane, it was, just because of great people there. You would have keeled over re the food and skimpy wine – served in one glass, a 3 oz. wine glass, always filled exactly half full. I had one glass for the entire Saturday evening meal, including for reds. I felt fortunate to have a seat for this meal, more grateful that we had fruit, cheese and wine in a pal’s suite before “dinner”. Thanks for the recap Liz. It sounds like you had a great experience. Sorry I missed this one! We missed you and this one was definitely about connecting with good folks. No snobby stuff and/or cliques. A solid group. I am so sorry I missed this one, too. Sounds like you had a great time…wonderful recap, Liz! Don’t be – you made the right choice. Keep writing and let your garden give you inspiration for recipes. I never forget about our garden – which got almost 2 precious inches of rain here while we had drizzle in Santa Monica. I am inspired by my garden and dreaming about replanting my herb garden in our grow box. I don’t know how you keep up that pace – did you see the comment from DJ? What a great evening. I will happily accept another 😉 Thanks, Greg. It seems bizarre to think that it really hasn’t been all that long since we started exchanging tweets and then finally met at Camp Blogaway last May. But thank goodness we did! So grateful for your friendship and so thrilled that I got to see at the party, albeit briefly!! OK, but we still have the holiday toffee contest to play with 😉 Grateful for your always-there friendship. You were such a burning light of energy and friendship for us all. Shine on and see you in Dec. It was great to see you (and sit next to you) at some of the IFBC sessions. I only wish we had a “little” more time to hang out and chat. 🙂 Sometimes, conferences get a little overwhelming for me. Instead of talking late into the night with people… I slept, and slept and slept. In a way, going to the conference was MY vacation away from my home and chores. See you next week at the WORC event!